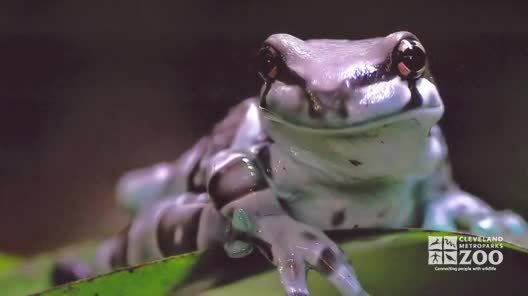 The habitat of the Amazon Milk Frog is the Humid rain-forest canopy, near slow-moving streams. Tadpoles hatch in one day; larval stage is approximately three weeks. The Amazon Milk Frog is nocturnal and lives in the rain-forest canopy. They often breed in tree cavities and seldom descend to the ground. 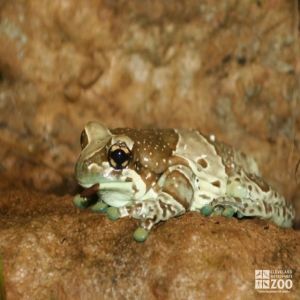 Breeding in Amazon Milk Frogs takes place between November and May (the rainy season). The male frog externally fertilizes a clutch of about 2,000 eggs in a gelatinous mass floating in water. The egg mass may also be deposited in water trapped in a tree cavity or in the centers of bromeliads. Eggs hatch in about one day, and metamorphosis from tadpole to juvenile adult takes about three weeks.